Replay suggests Davis made the catch. game. With one out and three on, Yankees batter Vernon Wells hit a 0-0 changeup from Blue Jays pitcher J.A. Happ to center fielder Rajai Davis, who threw to second baseman Munenori Kawasaki, who tagged baserunners R2 Chris Stewart (tagged off base) and R1 Ichiro Suzuki (tagged while on second base), ruled out and safe, respectively, by 2B Umpire Alfonso Marquez. Replays indicate Davis appeared to capture the ball in his glove and demonstrate secure possession before releasing the ball (and that Barry immediately signaled "safe" while Barrett did not mechanize any call), the call was incorrect. At the time of the ejection, the Yankees were leading, 2-1. The Yankees ultimately won the contest, 5-3. This is Scott Barry (87)'s second ejection of 2013. This is Ted Barrett (65)'s second ejection of 2013. Scott Barry now has -2 points in the UEFL (0 Previous + 2 MLB + -4 Incorrect Call = -2). 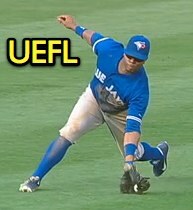 Ted Barrett now has 4 points in the UEFL (4 Previous + 2 MLB + -2 Incorrect Call [Crewmate] = 4). Crew Chief Ted Barrett now has 4 points in the UEFL's Crew Division (4 + 0 Incorrect Call = 4). These are the 143rd and 144th ejections of the 2013 MLB season. This is the 68th Manager ejection of 2013. This is the 65th player ejection of 2013. Prior to ejection, Buehrle did not participate in the contest. This is the Blue Jays' 11/12th ejection of 2013, 1st in the AL East (TOR 12; BOS 8; BAL, TB 5; NYY 3). This is John Gibbons' 5th ejection of 2013 and first since July 2, 2013 (Alan Porter; QOC = Correct). This is Mark Buehrle's 1st ejection of 2013 and first since May 26, 2010 (Joe West; QOC = Correct). This is Scott Barry's first ejection since May 8, 2013 (Joe Maddon; QOC = Incorrect [Crewmate]). This is Ted Barrett's first ejection since yesterday, August 21, 2013 (Jose Reyes; QOC = Correct). The comment made at the end of the video is exactly why I am against instant replay. It is a good idea on paper but they haven't thought it all the way through and there are too many variables in my opinion. We start out with a tie game, bases loaded, one out. The runner at third scores and Toronto gets the second out between second and third. We end with the score 2-1 Yankees, two outs, and runners on first and second. Now if this is ruled a catch, instead the runner at third scores and the runners stay put. We end with the score 2-1 Yankees, two outs, and runners on first and second. The difference between the two scenarios doesn't seem worth two ejections. What am I missing? How did Vernon Wells hit to his teammate? Who's call is that anyway? Write-up says that U1 (Barry) made the no-catch call. Is that the correct MLB flyball coverage? MLB is so anxious to cave into the ESPN crowd, they will screw the game up yet! MLB should step back, take a breath, and SLOWLY implement replay - testing it at Triple A, or during Spring Training - SOMEthing, before they try an start effect whole pennant races. They also should - gasp - ask the umpires what should be done. When the AL instituted the DH rule, they actually - surprise! - had a couple of UMPIRES do the basic write up of the rule. (Luciano claims it was him and Haller, I think). Challenge. There's no voluntary release here. I still want a formal explanation as to why the Layne ejection is deemed "correct," as well. He's clearly out. I understand why the points are awarded the way that they are, but the UEFL, in description, missed this one, and missed it badly. Yes. U1 has the CF coming straight in and straight back and everything to the RF line. They key off U1 and he read the CF as coming straight in and went out, so it was his call. This is part of my problem with the idea that everything should be reviewed. How exactly would you handle this if it is changed to a catch? I guess R3 tagged properly, so he's okay. The catch would be the second out, and tagging R2 off the base would be the third out. But now you have a time play since R3 ran home, so you have to review that also. What if there were fewer base runners or fewer outs? Lets say there are no outs here. R3 scores on the tag up, BR is out on the catch (1 out), R2 is tagged off the base (2 outs), but what do you do with R1 who is standing at second base because he saw U1 call a no-catch? You can't just put him back on first like he had tagged up. The defense is going to complain that they should be able to appeal at first base since he didn't tag up and is standing on second. I don't think they are thinking this through with the "Challenge everything except balls/strikes and HBP" line of thinking. I thought this too, but as I watched again, the ball came out during attempt to transfer. That counts as voluntary release. What a tough call! I was unaware that they had the technology to look at replays decades ago! In your scenario (no outs and the ball ruled a catch on review) then I would expect them to rule 3 outs on the play. 1) the catch, 2) tag of R2 between 2B and 3B, and 3) tag of R1 (a de facto appeal of his failure to tag up on the play). I agree this is a situation that is a mess, but then again it was a mess as it was. And it would have been a mess even if he had been right on his no catch call. Yes, it's a mess, but even after the "quick review" they keep talking about, you're still going to eject the offensive manager after you overturn it to a catch and give the defense three outs. The manager is going to argue that R1 would have tagged up if he knew it was a catch. In the situation as it happened, at least R1 saw Barry (U1) signal the no-catch and could then do what he needed to do. I'm going off of the Toronto broadcast saying that Barry signaled "no catch" immediately. I realize the call was ultimately wrong, but at least the runners weren't put in jeopardy. If I had to guess they would give them 2 outs BU, R2 and return R1 to first base. Then there is the question of what to do with R3. I'm not sure if he even properly tagged up, I assume a smart manager would get his pitcher to throw the ball to 3b to check that. No, the runner on the second. As for Layne, the ejection is irrecusable; the value judgment reflects the DiMuro Rule. The Layne ruling may be Irrecusable, but the write-up still says that the call is correct. The write-up should reflect the ruling, otherwise you can have situations where the write-up is incorrect, but because nothing can be challenged it remains incorrect. Does anyone know what the Blue Jays' single-season team record for ejections is? Any video of the Buehrle ejection? "Ball in glove. Foot on bag. Safe." does not indicate what you have stated. I checked it out last night. 16 in 1984. Bobby Cox accounted for half of those, no surprise, haha. Thank you. Where did you find this information? Retrosheet has some pretty good ejection info now. Here's the link to the 1984 list and you can toggle by year. Thank you, again. I've been looking for something like this for some time. After review, the Original Ruling has been affirmed unanimously in a 5-0-0 decision by the UEFL Appeals Board. Five Appeals Board members voted to confirm the Original Ruling. The momentum of the catch has been completed, there is secure possession and voluntary release. IN addition the ball never hits the ground. This is a catch. It's evident to me that all the elements of a catch are present, including voluntary release. F8 attempted to release the ball only after U1 ruled no catch -- that explains the attempt to transfer. I agree with Rich. At first look I was not sure if the release was voluntary. However, watching it again, I have a catch and Davis' hand going to the glove to retrieve the ball at what point the ball the ball comes out. I have a catch and voluntary release. The call is indeed incorrect and I vote to confirm the original ruling.